Okay, I admit it. I use to text all the time while driving. As a matter of fact it was the only time I hoped for a red light .. to finish that last few characters of the rest of what I had input speeding down a highway. I look back on that and think of how dumb that was. Now, when I hear that sound effect go off - I say "It can wait. Not worth it." 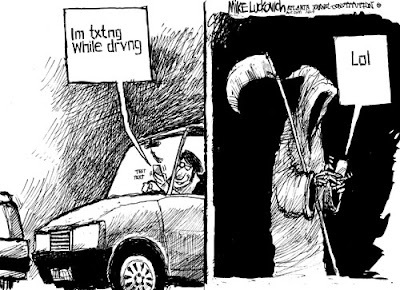 Unless you're living under a rock you probably have seen the months of press surrounding texting while driving. And if you haven’t, well, perk up – statistics don’t lie… and it's pretty scary. Here are some bullets that pretty much sum it up. Courtesy of Kens5.com. to about 1.6 million crashes a year . especially prone to text and drive." 21 states ban texting while driving and all are likely to hop on board. Parents – what you can do? Take action - no excuses. Install apps. Love this blog from the NY Times’ David Pogue illustrating the array of options available - from disabling texting while over a certain mph to setting up phone parameters entirely. Sure it'll cost you a few bucks and your kid is totally going to be mad at you for a few days but its worth a life and an accident for that matter.